I have been having a lot of fun with new free motion quilting designs lately 😊 First there was the wood grain quilting and now this fantastic echoed hearts design. I first saw this design on Pinterest, but unfortunately the pin doesn't go to a post about it. In looking at the pin again, I see that I've made it more dense than in the picture, but that's no surprise to me. 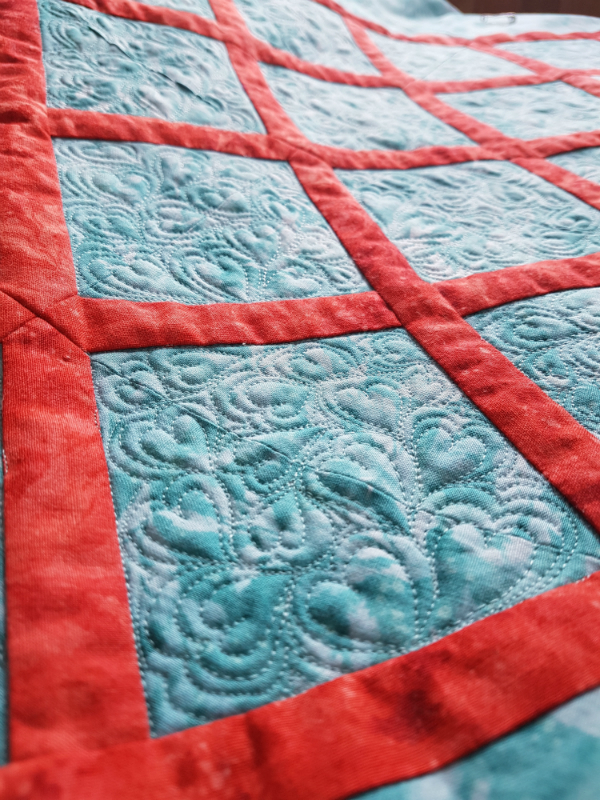 I do like dense quilting! If you asked me to draw a couple dozen hearts, they'd probably turn out just like these quilted ones...a few perfectly shaped, a few lopsided, some long and skinny, some short and fat. I love the variety of them. Having the Aurifil thread chart really came in handy for matching the thread to the aqua and the 5006 is a perfect match. 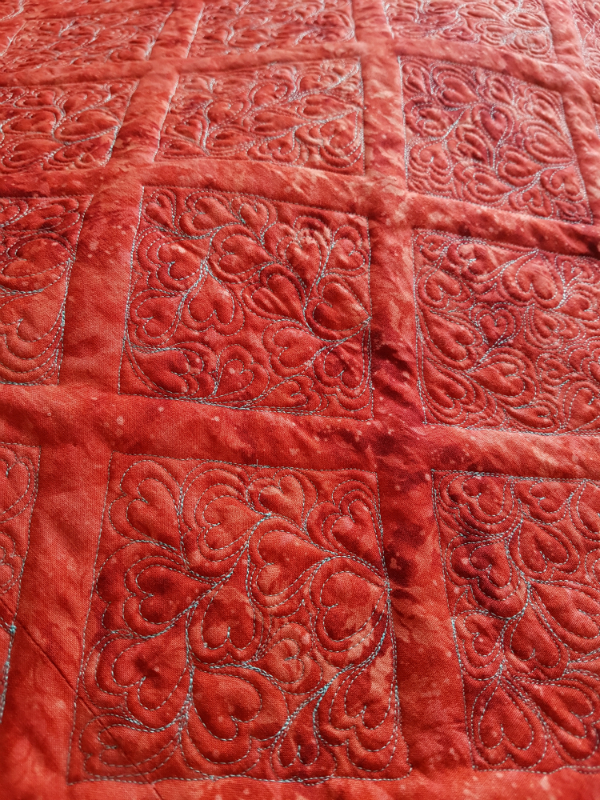 I love that on the front you get the texture of the hearts without the thread colour affecting the look of the quilt. But on the back, just look how that 5006 pops against the red! 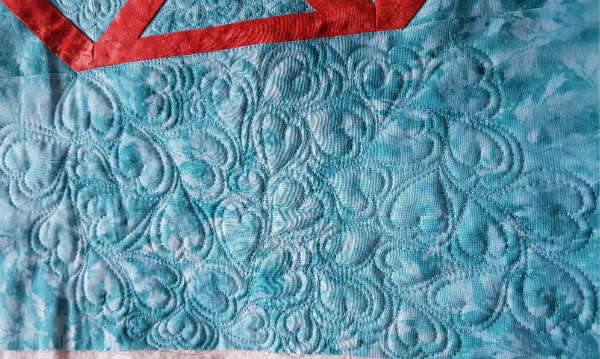 Every time I finish quilting and have to put things away, I have to lay the quilt out flat first, with the back up so that I can admire how pretty this looks. I can't decide which side I like best! 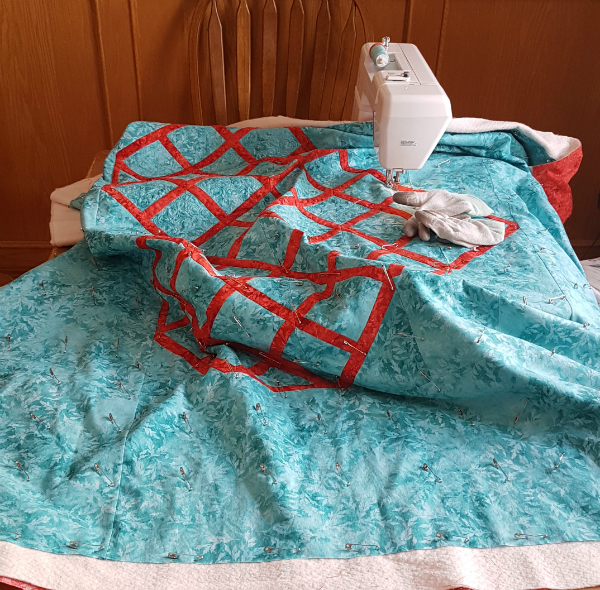 I've said before that I sew at our kitchen table, which means that I'm constantly having to put everything away when I'm finished. I wish I could just leave it looking like it did on Sunday afternoon. That Essence fabric is gorgeous, isn't it? I love how the thread brings some of the color from the top to the back as well. The hearts look great. This is such a fun little motif. This would be adorable on a little baby quilt. So my question easier than swirls? Great little pattern for quilting. Love that you figured it out and that thread worked so well! The quilting is beautiful Leanne. I'm not brave enough to try hearts. Yours look fabulous. Well done. You've quilted the heart design so well and the thread was a great choice. My last but one project was an experiment in using the woodgrain quilt pattern - I really like the effect but was surprised just how long it took me to quilt a lap size quilt using the design. I'm very fortunate to have a room where my machine can stay in place (unless we have guests) but like you started I started sewing on the family table! Thanks for taking the time to leave me a message. I love hearing from you. Sign up for The Bulletin and receive my free Wind Farm quilt pattern, available exclusively to subscribers. The Bulletin is published monthly, with news from my blog, a round up of things to make and a family favourite recipe. Hi! I'm Leanne, a Christian passionate about quilts. Pour yourself a cup of something good and join me as I share my quilts and my faith. The posts on this blog may contain affiliate links, which means that if you click on the link and then make a purchase I may receive a small commission. This does not affect the price you pay. I only link to products I love!